Caption slip reads: "Photographer: Olmo. Date: 1954-04-19. Reporter: Harmon. Assignment: Barber shop bomb. 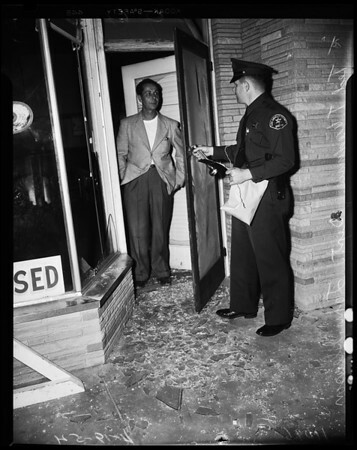 61/62: l to r: Barber Ted T. Wedmore, 43, who was in shop when bomb went off and Deputy Sheriff John Gleason -- at door which was blasted out by bomb. 63: l to r: Deputy Sheriff Jack F. Fitzgibbons with Wedmore alongside and in front of damaged windows".